The money is in the details! Many elements of being at a large horse show like the Silver Dollar Circuit can be overwhelming to both horse and rider. 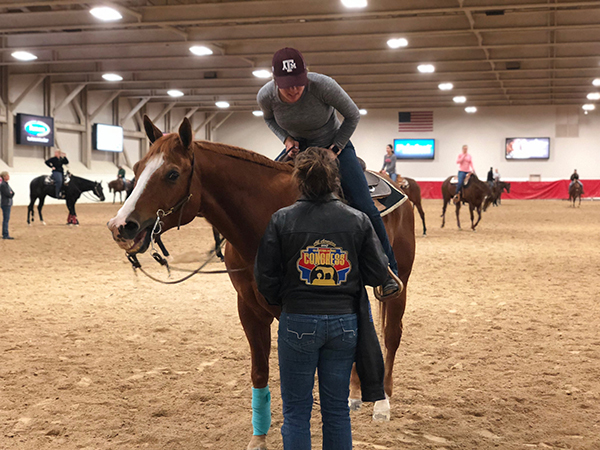 Busy warm up pens, rushing to get ready, and show pen jitters are just a few elements that aren’t present when practicing at home, and these can be the factors that mean success or failure in the show pen. Jewett and Hokana emphasize the need for a rider to be consistent and definite on the pathway to success in these situations. By deconstructing the elements of your ride, you can create consistent patterns that can carry over from practice to the show pen. One of the main components necessary for every ride, in every event, is the transition. Setting your horse up for the position of the transition. “Go through every piece of that transition. We want our horse’s belly to be up. If we’re looking at the transition to a lope, we want to shape our horse’s hip and then ask for the actual transition,” tells Jewett. He notes that the proper transition sets your horse up to be correct in that gait without resorting to fixing them a few strides in. “We’re always sending a message to our horse. We’re either sending them confidence or we’re telling them something is wrong. Our body language, our breathing, our approach, how sharp we get with our hands, and when we release is always telling them, ‘you’re doing good,’ or ‘there’s something to be worried about.’ “You can make or break your class based on the 10 minute warm up beforehand. All horses are in tune to us more than we realize,” advises Hokana. The over encompassing advice from these experts here is to show your horse like you practice at home. “You have to be your best coach and your horse’s best coach,” says Hokana. Jewett mirrors that sentiment by urging exhibitors to refrain from “winging it.” The more you have every step ready, the better your presentation will be in the pen, and the longer your horse will maintain the proper position.” They both stress that riders never compromise transition for nerves or better rail position. Stay true to what you practice. Visit www.SilverDollarCircuit.com for results, score cards, and the live feed. Monday Karaoke Party at Cinch Bar at 6 pm.